I have to hand it to Kurt. He has been planning this trip for a long time and convinced me to join him about a year ago. He did all of the travel and hotel booking and I tried to stay on top of the real-time sightseeing. Kurt can tell you more about booking things in advance online, but for me there were three key prep steps: learn the language basics, download the free Rick Steve’s Audio Europe podcasts or app, and have a local friend in each city who can give you insider tips. Kurt tried to find Couchsurfing.com hosts in each city, but that only worked out for Athens. He used a similar site, Airbnb.com, for Venice, and a Couchsurfing host in Rome was kind enough to basically be our free tour guide for a day in Rome. While they were all strangers to us, they quickly became friends and made our trip much easier as we had someone to rely on in each city who spoke English. Neither Kurt nor I spoke Italian nor Greek. While it’s not something we did overseas, I’d also like to thank my cousin Grady and his fiancee Stephanie for showing us around Chicago during our layover there. My iPhone was useful for taking pictures, listening to audio tours (the Rick Steve’s app, as mentioned above), and getting on wifi when it was available for free (generally only where we lodged). I also put $10 into my Skype account and was able to call any phone for about 2 cents/minute when I was in a wifi zone. It worked flawlessly for the one or two calls I made. Otherwise, I stayed in touch via e-mail, Facebook, Twitter, and Instagram. I was able to access all of these services in both Italy and Greece. One final note of preparation: I packed a small umbrella, but Kurt told me that the weather is always nice when he goes on vacation. I was ready to see him eat his words, but we truly did have excellent Mediterranean weather during the entire trip. Late-March is definitely a good time to visit. Cool at night, low humidity, and rarely above 80 during the day. We had about 2 1/2 days in Rome to try and check everything off our list. 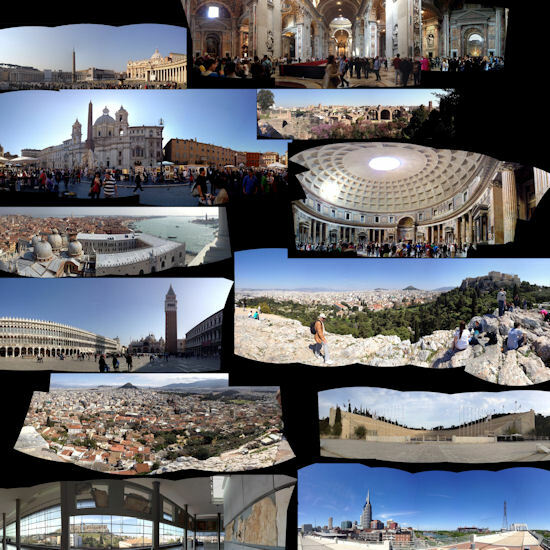 We visited most of the major sights, although I wish we had time to see the Villa Borghese in particular. 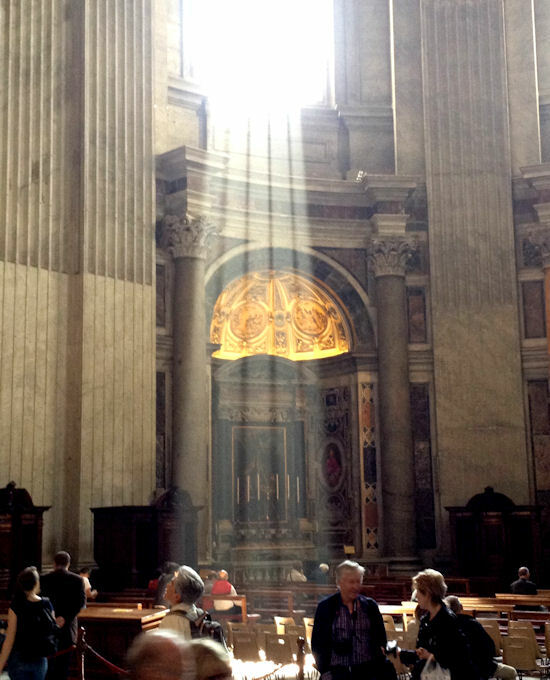 My favorite attraction, of the entire trip even, was Saint Peter’s Basilica (pictured below) and the Vatican Museums. I realize that it was financed by indulgences, but never have I seen more awe-inspiring architecture and art, particularly from the inside of the basilica. Avoid the constant barrage of tour guides in the streets there, though. Trevi Fountain was another favorite of mine; it was the first major attraction of our trip and it was much bigger than I had imagined. I have yet to see a photo that properly portrays the scale of the structure. Oceanus, the central statue, is probably 15 feet tall. Kurt and I knew that we had planned well after telling some Italians how to find Trevi (it’s kind of hidden in the middle of nowhere) as well as directing a group of drunk Nashvillians – yes, from Nashville, Tennessee. I declined to have a scoop that night, but Kurt found some delicious gelato (which is somehow way better than ice cream) at a place called White on the south end of Piazza Barberini, a metro stop. I also enjoyed walking up Palatine Hill (part of the Roman Forum with views of the Coliseum), imagining the view from one of Rome’s “seven hills” and daily life in the Empire two thousand years ago. I had a nice chat with Danny (the local Couchsurfing guy who spent most of Tuesday with us) as we walked up the hill that afternoon. In general, we found most of the Romans and Venetians to be friendly and hospitable to tourists. 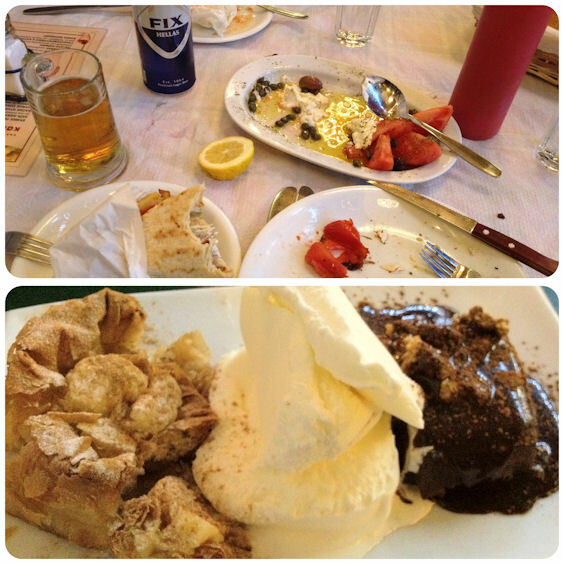 We had our favorite meal at Sanlollo, east of Termini station, within walking distance of our hostel. It was “just pizza” but the Gorgonzola and speck (Italian bacon), house red wine, and arancini (tomato rice balls) antipasto made for a perfectly delicious meal. This place was recommended by a local and I don’t think tourists go there very often. It was one of our first Italian dinners and we didn’t realize that 7:30 is the earliest that most restaurants open. We got there at 7… so I just ordered my wine and waited for the kitchen to open. They had free wifi there, so Kurt and I Google Translated practically the entire menu. Who knew that the air pressure from high speed trains going through tunnels was so painful? There were probably about 15 tunnels on the ride from Rome to Venice. Kurt says his earplugs helped a little. Otherwise, it was a pleasant ride, especially since we got to sit next to two lovely young ladies (Jenny and Beth) from Boston and Connecticut. They were doing a whirlwind trip through Paris, Rome, Florence (where they departed the train), and a couple days after us, Venice. Who wants to calculate the probability of running into them at a cafe next to Rialto Bridge three days later? Is it more or less than the chance of running into Nashvillians in Rome? 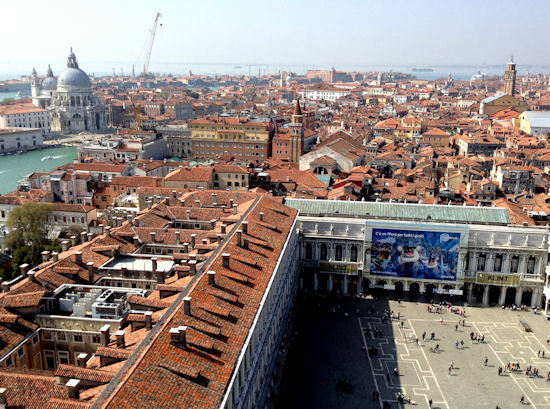 If you take Venice’s small population into effect, you might say that the chances of running into someone you know are relatively high, but the city hosts an average of 50,000 tourists a day. I think we were there at the perfect time of year, though. There were people everywhere, but it didn’t feel like a sweaty summer tourist trap. Sorry, I’m getting off track. 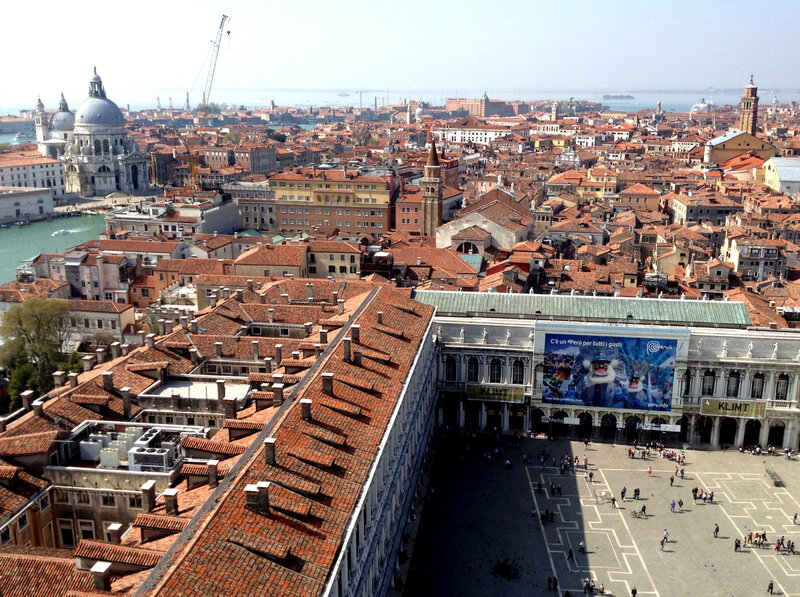 Favorite things about Venice: the view from Campanile San Marco (pictured below), Burano island (for its pastries, seafood, and quiet seaside ambiance), and lunch with gondoliers at Trattoria Chinellato. The Peggy Guggenheim Collection had a variety of artwork, but I’m not sure it was worth the 12 euro ticket. I also recommend looking for lodging in Mestre on the mainland. There is a beautiful park with a jogging trail into downtown Mestre and our host Alessandra’s apartment was only ten minutes from the island by bus. It’s also more affordable and easier to port luggage on dry land instead of squeezing into a vaporetto and dragging bags up and down bridges while finding your hotel. Venice overall was a little more difficult to navigate than the other cities. Even with Alessandra’s help (we’d ask her questions every night), we were never quite sure if we were going to the right place whenever we’d hop on a boat or bus. Don’t hesitate to ask the vaporetto operators – they speak better English than the bus drivers. Oh, and beware of the pigeons! As we were leaving the island on our last day, I got dive-bombed and was left with a huge streak of bird guano down my back. 2 1/2 days went by quickly in Venice. I wish we had one more day to wake up late, check out the beach on Lido, and have a nice dinner on one of the islands. As in Rome, we were usually so tired by 8pm from walking all day that we didn’t have the energy to go searching for anything farther than a few blocks walking distance. Fortunately, though, in Rome and Venice, lousy cuisine is hard to come by. We arrived in Athens on a Saturday evening, so it was our best opportunity of the whole trip to check out some European night life. Little did we know that dinner is even later in Greece than in Italy. We started eating after 11 and didn’t finish dessert until 1. Giannis, our host for four nights, took us out to one of his favorite spots – I believe it was called Taverna tou Psyrri, but even a photo of the facade is hard to read as Greek does not transliterate very well into English. Moving on, I had a gyro here and it was impossible not to like their sliced tomato salad with olives and a huge pile of feta cheese. I also nursed a large can of Greece’s popular Fix beer (basic lager with a tinge of spice). We moved one door down (behind my seat from the vantage of that photo) and had an excellent dessert, with a pile of ice cream in the middle this time (pictured below). The pastries were perfect, but I think the key ingredient in their ice cream is an acquired taste – can’t remember what it was called. We also had digestif shots of warm rakomelo (cinnamon) and Chios Mastiha (brandy-based liqueur). While I’m on the topic of drinks, be sure to try ouzo if you like Jagermeister or absynthe. Giannis and I nursed a bottle of it the next night while watching The Bourne Identity on TV. Anyway, you can imagine we were all too tired that first night, once again, to find a Euro-club. *Sad trombone. * Really, though, that’s not something I personally care about when I’m in tourist mode. Favorite sights in Athens: too many to narrow down to just a few. We had an extra day in Athens, so I had time to do some museuming while Kurt split off to his own thing that afternoon. Giannis helped me narrow my choices down to the National Archaeological Museum and the “New” Acropolis Museum – the latter is not to be missed. The sculptures in both museums from the 5th and 6th centuries BCE were some of the most impressive I’ve ever seen, particularly the Phrasiklea Kore and the Artemision Bronze. While I’ve never done hands-on archaeology, I’ve always loved putting the pieces of history back together. I became a religious studies major in college mainly because of my interest in biblical manuscript history. At the Acropolis Museum, constructed in 2009 at the base of the flat-topped rock, I found myself piecing together the art and architecture of the now skeletal Parthenon that was once as lavishly decorated as the Vatican. 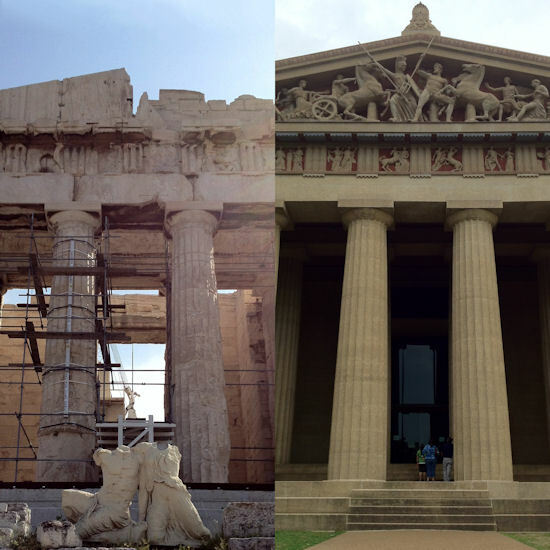 Seeing the real thing in Athens, I could also better appreciate the research that the planners of the Nashville Parthenon had to do, particularly for the sculptures on the pediments and metopes. We met one of our favorite Greek personalities during an afternoon walk down from Philopappos Hill. For the life of me, I can’t remember her name, but she was stationed in one of the many tiny guard shacks scattered among the ancient sites. She was struck by our “heavy” American accents when we asked for directions – she was more accustomed to British English. She was a singer and showed us photos of her performances (that she happened to carry around with her). She was very interested in where we were from and what we thought of Greece. After ten minutes of chatting – in French, as well – she pointed us in the direction of a good place to eat. She and Giannis epitomized the hospitality and friendliness of the Greek people. I occasionally ended up using a little French or Italian as some of the older people did not speak English. The graffiti we saw all over the city was a symbol of the economic decay there, but the locals compensated by welcoming us and directing us to have the best time possible while visiting their ancient city. One other experience I have to mention briefly was the chance opportunity Giannis and I had to see a professional tennis match at the Athens Lawn Tennis Club. Located next to the Temple of Olympian Zeus, the club allows guests to watch matches on center court for free. We walked in on the last set of the final men’s singles match of the tournament, Greece’s #1 player Konstantinos Economidis vs. some grumpy guy. I took a video and a few pictures. So that’s the “short account” of a trip of a lifetime. I can’t think of a good way to sum it all up… I think the 6-to-7-hour timezone difference left me tired for almost an entire week upon my return, so I’m finally back to normal. Jetlag aside, it was one of the best travel experiences of my life. Have you been to Italy or Greece? What were your favorite moments? Music: A lot of Rihanna, Beyonce, and 80s music. We also noticed Lady Gaga, Adele, Bruno Mars, Katy Perry and a Foster the People remix. At Alimos Beach in Athens, they were playing 70s rock (Eagles, Moody Blues, Rolling Stones) with some obligatory 80s tunes thrown in. Giannis really liked the house music of Offer Nissim and David Guetta. Friday, March 23rd: Louisville to Nashville (by road). Had dinner at my favorite local restaurant, Calypso Cafe (East location). Saturday, March 24th through Sunday afternoon: Nashville (BNA) 10:55 to Chicago (ORD) to London (LHR) to Rome (FCO) 14:20. British Airways (using American Airlines for the domestic leg). Metro pass from Termini, scan at each metro gate. Wednesday, March 28th: Rome (Roma Termini) 13:45 to Venice (Venezia S. Lucia) 17:33, Trenitalia. 340 miles at approx. 150mph. Stops in Florence, Bologna, Padova, and Mestre. Venice population: 809,000. Daily bus travel to and from Mestre (Viale San Marco), honor system. Saturday, March 31: Venice (VCE) 9:35 to Marseille (MRS) to Athens (ATH) 19:05. Air France. No reclining seats, but plenty of legroom. http://www.couchsurfing.org/people/giannisthebest/ in Neos Kosmos neighborhood. Athens population: 3 million. Metro and tram passes, honor system. Wednesday, April 4: Athens (ATH) 8:15 to London (LHR) to New York (JFK & LGA) to Nashville (BNA) ~23:00. We were awake for over 25 hours, trams, trains, and airplanes all day. British and American Airlines again. Random notes for myself: Flight to Rome, Daniella (Argentina). Bar Oasies/American Breakfast & Birreria (Cameron Diaz look-alike, mapped). Ubaldi metro. “Acanto” leaves on “Corinzio” columns. Antikythera mechanism, Dimitris Pikionis (Athens).